Small volumes of CCL17 elisa kit vial(s) may occasionally become entrapped in the seal of the product vial during shipment and storage. If necessary, briefly centrifuge the vial on a tabletop centrifuge to dislodge any liquid in the container`s cap. Certain products may require to ship with dry ice and additional dry ice fee may apply. MBS175885 is a ready-to-use microwell, strip plate ELISA (enzyme-linked immunosorbent assay) Kit for analyzing the presence of the CCL17/TARC, ELISA Kit target analytes in biological samples. The concentration gradients of the kit standards or positive controls render a theoretical kit detection range in biological research samples containing CCL17. 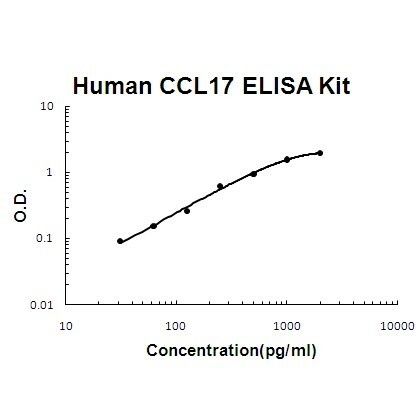 The ELISA analytical biochemical technique of the MBS175885 kit is based on CCL17 antibody-CCL17 antigen interactions (immunosorbency) and an HRP colorimetric detection system to detect CCL17 antigen targets in samples. The ELISA Kit is designed to detect native, not recombinant, CCL17. Appropriate sample types may include undiluted body fluids and/or tissue homogenates, secretions. Quality control assays assessing reproducibility identified the intra-assay CV (%) and inter-assay CV(%). Principle of the assay: human CCL17 ELISA Kit was based on standard sandwich enzyme-linked immune-sorbent assay technology. A monoclonal antibody from mouse specific for CCL17 has been precoated onto 96-well plates. Standards (E.coli,A24-S94) and test samples are added to the wells, a biotinylated detection polyclonal antibody from goat specific for CCL17 is added subsequently and then followed by washing with PBS or TBS buffer. Avidin-Biotin-Peroxidase Complex was added and unbound conjugates were washed away with PBS or TBS buffer. HRP substrate TMB was used to visualize HRP enzymatic reaction. TMB was catalyzed by HRP to produce a blue color product that changed into yellow after adding acidic stop solution. The density of yellow is proportional to the human CCL17 amount of sample captured in plate. Background: Chemokine (C-C motif) ligand 17 (CCL17) is a small cytokine belonging to the CC chemokine family that is also known as thymus and activation regulated chemokine (TARC). CCL17 is expressed constitutively in thymus, but only transiently in phytohemagglutinin-stimulated peripheral blood mononuclear cells.1 This chemokine specifically bindsand induces chemotaxis in T cells and elicits its effects by interacting with the chemokine receptor CCR4.1,2The genefor CCL17 is located on chromosome 16, in humans, along with other chemokines called CCL22 and CX3CL1.3,4 Thestandard used in this kit is recombinant human CCL17, consisting of 71 amino acids with the molecular weight of 8Kda. NCBI/Uniprot data below describe general gene information for CCL17. It may not necessarily be applicable to this product. CCL17: Chemotactic factor for T-lymphocytes but not monocytes or granulocytes. May play a role in T-cell development in thymus and in trafficking and activation of mature T-cells. Binds to CCR4. Belongs to the intercrine beta (chemokine CC) family. 1. CCL17 is an antimicrobial protein with bacteriocidal activity against E. coli and S. aureus.